Hey everybody, not everyone may know me but some may remember me as the guy whose BMW was totalled at Intercity 2 summers ago, or as the guy in the VW Rabbit at a few of the Autoslalom events last year. 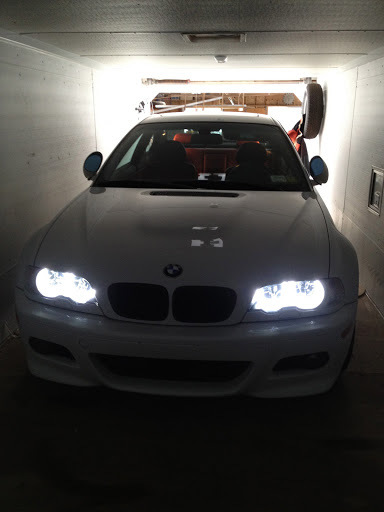 Anyway for those that don't know me my name is David and I wanted to share with you the BMW M3 I picked up last fall. 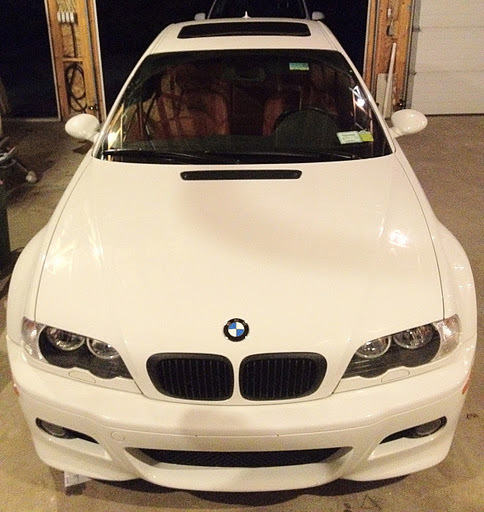 So after 1 year and 3 months of searching after my previous 3-series got totalled, 1 Volkswagen and 1 failed purchase later I finally found my dream car, a 2005 Alpine White E46 M3 with Imola Red nappa leather interior and manual transmission. The car was located just outside of New York City and was a 2 owner car with just under 41K miles and was dealer maintained. The car was basically stock except for black powder coated wheels, a Dinan exhaust and tune, and a rasp pipe (eliminates the infamous rasp on these M3s). Here are a few pictures from the ad. My dad and I flew down on October 28th to pick up the car. I could not stop smiling for the rest of the trip after the owner picked us up in the car. The car was in fairly good condition, though the bottom of the front bumper had road rash and the car was in serious need of a detail. After we had finished the transaction, we went into part of the massive city to meet up with a friend before we started our 1800 mile journey home that night. That night we drove for maybe 3 hours and got maybe a third of the way through Pennsylvania. We were actually very lucky as that same night New York had gotten about 8 inches of snow and where we had stopped for the night all we saw was some rain. We left early in the morning and our plan was to get to Chicago by evening and visit with some friends, so we drove about 12 hours through some nasty weather in Pennsylvania, got through Ohio and Indiana with some nice sunshine, and were in the Chicago area by night fall. In our friend's parking garage I parked next to an F430, and there was also an Audi R8, G55 AMG, and a few other high end BMWs and Benz (don't have any pictures, sorry). The next day we stayed in the Chicago area longer than expected and left in the afternoon with the intention of making it home that night but we ended up staying in Duluth after several hours of constant rain. As we were leaving the next day I remember probably the greatest part of the trip where as we would go through the tunnels I'd slow down and drop gears and go WOT, man did it sound amazing. We got home that night, which happened to be Halloween and got some interesting looks from people as I drove around town. Here are some pictures from Chicago and as we were leaving Duluth. I was able to drive the car for another week in town and luckily was able to complete the RIV inspection just before I had to put it away, though the tires were too worn and I couldn't get it safetied, so first thing this spring the car gets a nice new set of Michelin Pilot Super Sports. I ended up moving it to a friend's warehouse so I could park my DD in the garage and took a few pictures as we were trying to get it into our trailer. This was definitely a trip of a lifetime and I'm very glad that I got to go with my dad and pick up this amazing machine. This was one of the longest road trips I've ever done but we had no problem with this car, it handles and rides amazingly, and I was so excited to have it that out of the 24 hours or so of driving I only let my dad get behind the wheel for 3-4 hours. I pulled off some parts for some nice winter projects including retrofitting FXR projectors and full HID system as the car came with halogens ($750 option for Bi-xenons), custom stitching the shift boot and ebrake boot with red stitching to go with the rest of the interior. I've also ordered a few other parts and made a list of future modifications I'd like to do. I bought this car with the intention of tracking it and participating in some HPDE events as well as autocross, and the modifications I plan on doing will be focused on that as well as some cosmetic and comfort mods here and there. Man everything sounds nice on there, especially the HPF turbo kit - but the not so secret guilty pleasure of mine is lighting, and going with the Lightwerkz package is a sick idea .. I hope I, at some point, get to the caliber of craftsmanship Caesar and his crew put out.. Nice car for sure. Thanks, I'm really hoping I can get at least half of the list done if not all but the BBK and turbo by the end of the summer. Everything else that I have and ordered should be on there by the end of April after exams. Beautiful looking car, love the color combo. Osap is very generous now a days ! Thanks, it was definitely worth travelling for and looks much better in person. I wouldn't know about OSAP though, my parents started a fund for my tuition when I was a kid. That car is one gorgeous machine. Great pickup forsure. 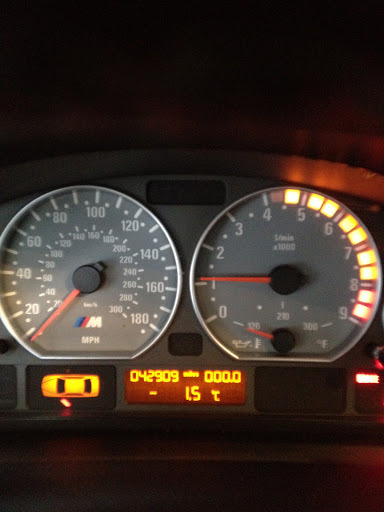 What is the mileage and what did you pick it up for? if that's personal info that is fine. I'm actually going to Chicago tomorrow morning to buy my friend a car, I'm currently visiting wisconsin staying with a friend here. I had no idea there were so many nice cars in Thunder bay, would be great for this forum or someone to organize meets outside of the regular Athletic club area ones. Start up a build thread, would love to see more of your car and maybe see it in person this year. I'm thinking of starting my build thread once my main things are done in the spring. There will be meets organized once the weather warms up. I'm thinking bi-weekly. 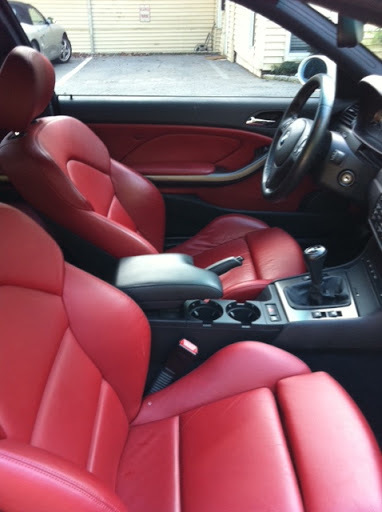 Welcome to our online automotive community, David! Very nice M3, I'm looking forward to seeing it this summer. Great idea masking off the front end, that's definitely a long drive back from NYC. Keep this thread updated with your new mods, I'm confident you can set some good lap times at a few events this summer. When we picked up the car it had just over 40900 miles so we put about 2000 miles on it as you can see in the shot of the cluster, 1800 on the trip back and another 200 in town. I got lucky as two almost identical cars popped up on the forum I was searching within 2 days of each other and this one had less mileage and was slightly cheaper, so I jumped on it and got it at his asking price of 28K, which I think is a good deal considering the low mileage. Add 19% tax (stupid duty) on it and you'll get the final total after registering it, which still fell within my budget. Have fun on your trip to Chicago, it's definitely a nice place though I didn't get to see much of it. It seems like a lot more nice cars are being brought into Thunder Bay which is quite nice to see. I was actually surprised when I found out there was another white M3 in town, my cousin told me as I was heading back into town with the car. I will definitely keep this thread updated, and I will probably be starting a small project soon. I'm really excited to install all the other stuff I've ordered and regret putting it in a warehouse for the winter. I'm also looking forward to seeing your build and would love to see your car in person as well. Thank you Marc, I was actually on TBAEC as well, under a different name though. I'm really looking forward to coming out to meets if I'm in town and I'm definitely excited for some autoslalom and track events. I'll give some rides at autoslalom if anyone would like. I heard Gimli and Brainerd are good places to look into for track events and Gimli is only 4 hours from where I work, plus I'd be able to trailer it there. Love the Car! 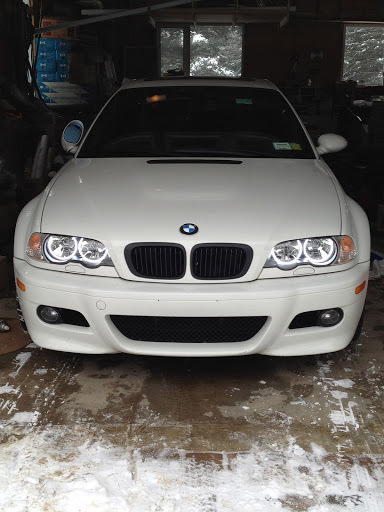 Always like alpine white on BMW's , I'm deffently keeping an eye out for your car now! I have a little bit of an update. I was planning on picking up and driving the car home tomorrow but with the weather being "so nice" and not being able to get temporary plates I'm just going to throw it back in a trailer and haul it home. I have time booked for Thursday to get the new tires put on and the safety completed, so if all goes well and the roads are clean I should have it back on the road within the next couple weeks. By Tuesday I should have the final parts needed for my projector retrofit and I will finally be able to get a start on that and have proper lighting hopefully before or soon after the car is on the road. So I pulled out the car on Sunday, started with no trouble, took it out for a little spin to warm everything properly up before hauling it back home. I was able to pick up some parts from the border today but I still have to go back tomorrow and pick up the tires, so if all goes well I should be driving it on Friday. I have a detail scheduled for next weekend and will be sure to take plenty of photos before and after. For now here's a picture to show what's coming up next, hopefully to be done and wired by this weekend, I know Kevin will like this one. Last edited by Nabs; 04-03-2012 at 08:17 PM. Thanks! The duck-bill spoiler/trunk you are referring to is known as the CSL trunk, which I definitely plan on getting by the end of the summer along with some coil overs and possibly some new wheels. I finally got the car safetied and on the road after another small hiccup and new control arm. 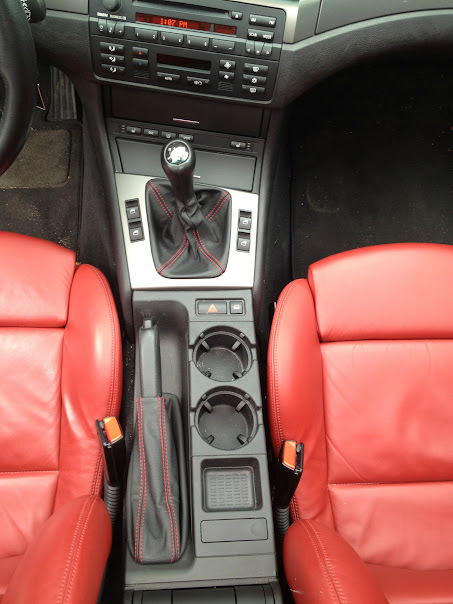 I also finished restitching the shifter and brake boot in red. It's not an exact match but matches the theme of the rest of the interior and adds a nice contrast. 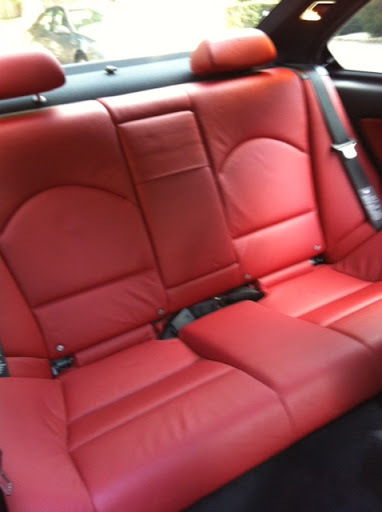 The leather could definitely use a good cleaning. I should have the projectors (most excited for) and other parts sitting in my room installed by next weekend. I also bought some red Plasti-Dip and I'm going to try and paint the lip on the wheels and see how it looks, if I don't like it I can easily pull it off. Probably going to pick up some paint and paint the reflectors and headlight inserts to match the car and give it a cleaner look. Coming along quite nicely. I think you did a really great job on the projector retrofit. Interested to see how the red lip turns out, should look good.